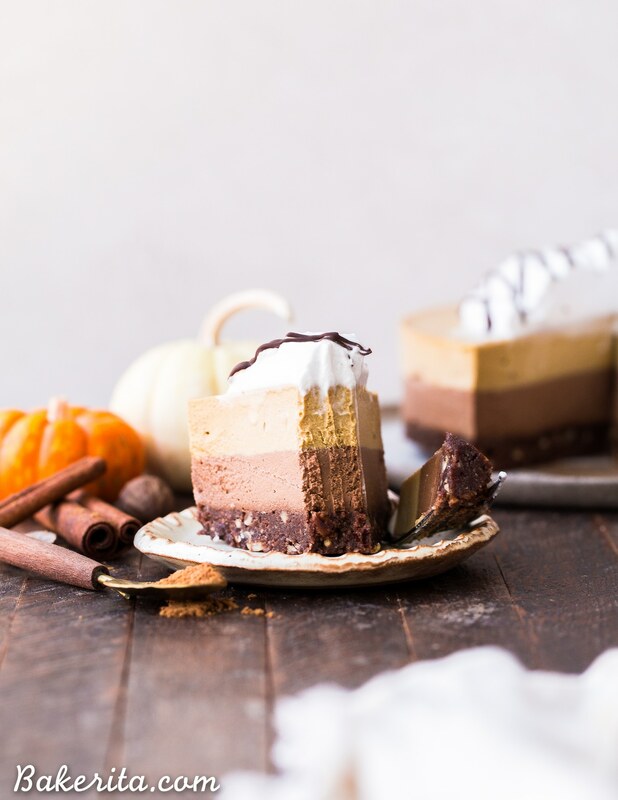 This No Bake Layered Chocolate Pumpkin Cheesecake has layers of chocolate and pumpkin spice cashew-based cheesecake, on top of a chocolate date crust. This make-ahead raw dessert is perfect for the holidays. Who’s ready for Thanksgiving?! It’s coming up QUICK this year – as it usually tends to do. I’ve got my plant-based Thanksgiving menu tentatively planned, with a list of recipes linked in my Evernote. So far, I’ve got a whole bunch of sides (including cauliflower mashed potatoes, cabbage slaw, mushroom gravy, roasted brussels sprouts, and some kind of stuffing TBD) and a lentil loaf as our vegan main dish. 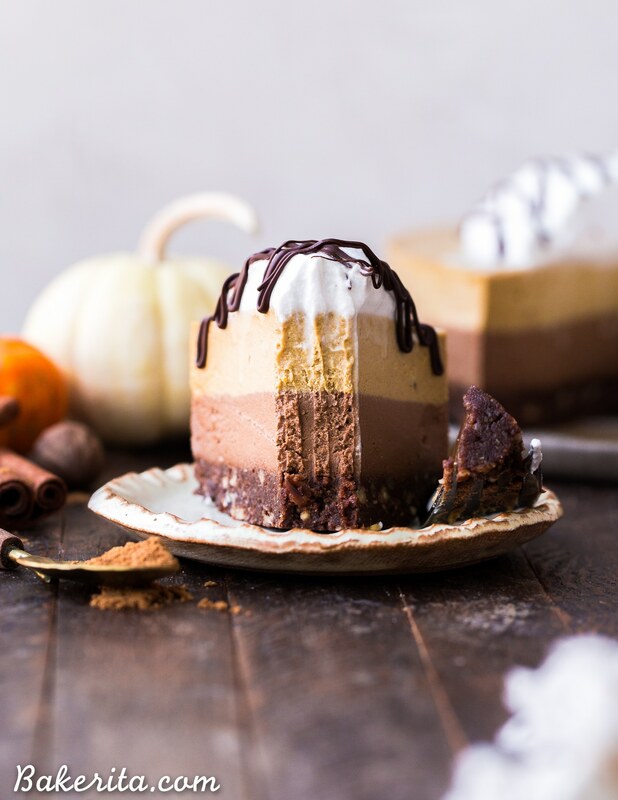 Desserts are still to be determined, but this layered chocolate pumpkin cheesecake will definitely be on the menu. It will satisfy the pumpkin pie lovers in my family (my sister…only her) and the chocolate lovers in the fam (of which there are LOTS). Thankfully, it’s super easy to make. Even better, it can be made ahead of time, stored in the freezer, and left to defrost in the fridge on Thanksgiving Day. There’s really nothing better than anything you can make ahead for Thanksgiving to reduce the stress in the kitchen that day. Then comes the layers! They’re actually the same base for both layers, and cacao powder + a little extra maple syrup get added to half of it after it’s all blended up. 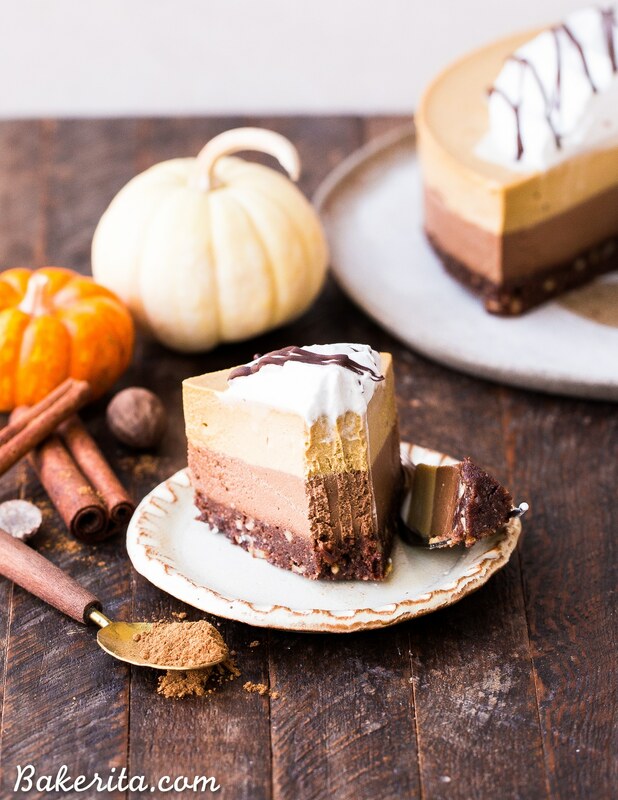 It has a smooth, rich pumpkin-y flavor that works so well with the chocolate. I recommend topping it off with a BIG dollop of coconut cream and/or a drizzle of chocolate. It’s sure to be a hit on Thanksgiving…or let’s be honest, ANY other day of the year :) enjoy!! 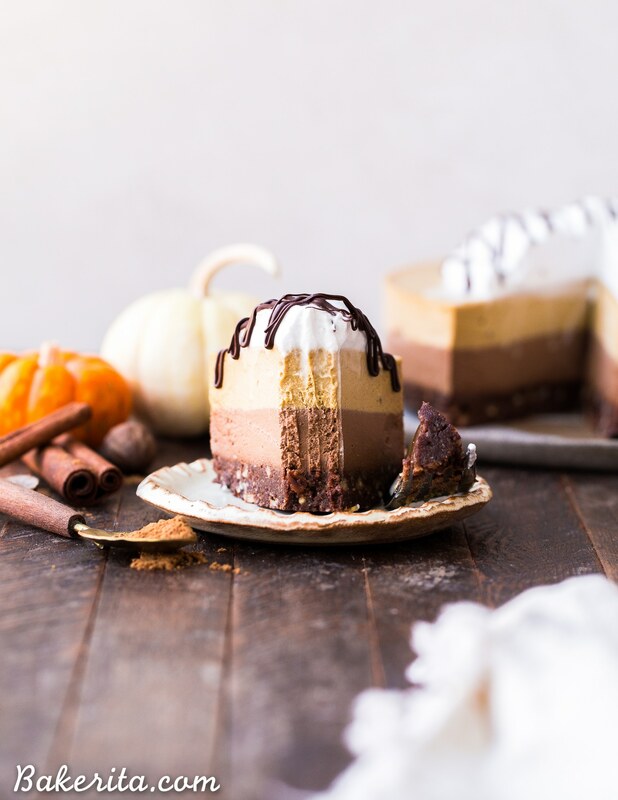 This No Bake Layered Chocolate Pumpkin Cheesecake has layers of chocolate cashew cheesecake and pumpkin spice cheesecake, on top of a chocolate date crust. This make-ahead raw dessert is perfect for the holidays. Add the pecans, almond flour, pitted dates, cacao powder, coconut oil, and salt to a food processor or high-powered blender and pulverize until it comes together into a sort of sticky dough, with small pecan bits remaining. Press the date dough into the bottom of the prepared pan. In the same food processor or high-powered blender (no need to wash between - I used my Vitamix, but most powerful blenders should do the job), combine all of the filling ingredients except for the cacao powder and 1 tablespoon maple syrup and blend for about 2 minutes, or until the mixture is silky smooth and creamy. Scrape down the sides as necessary. Pour half of the filling into a separate bowl. Add the cacao powder and remaining one tablespoon of maple syrup to the other half of the pumpkin mixture, still in the blender. Blend it in until smooth. Pour the chocolate filling into the prepared pan over the crust. Smooth out the top and tap the pan hard against the counter a few times to release any air bubbles. Spread the remaining pumpkin filling over the chocolate filling and smooth out the top, tapping the pan against the counter again to release air bubbles. Place in the freezer to set for at least 4 hours or until completely firm. Let thaw at room temperature for 10-15 minutes or for an hour in the refrigerator before serving. I recommend running your knife under hot water to warm it up before cutting the cheesecake with the still-hot (dried) knife. Serve with coconut whipped cream and a drizzle of melted chocolate! Such pretty layers, I love this cheesecake! I made the recipe and it was super delicious. It was much thinner, though, than the cake in your pictures. Do you have ideas on what may have gone wrong ? Thank you! Hi Kristina, I’m guessing you used a pan that’s bigger than a 6″ pan, which is what I used and call for in the recipe! A larger pan would need for the recipe to be doubled or even tripled. 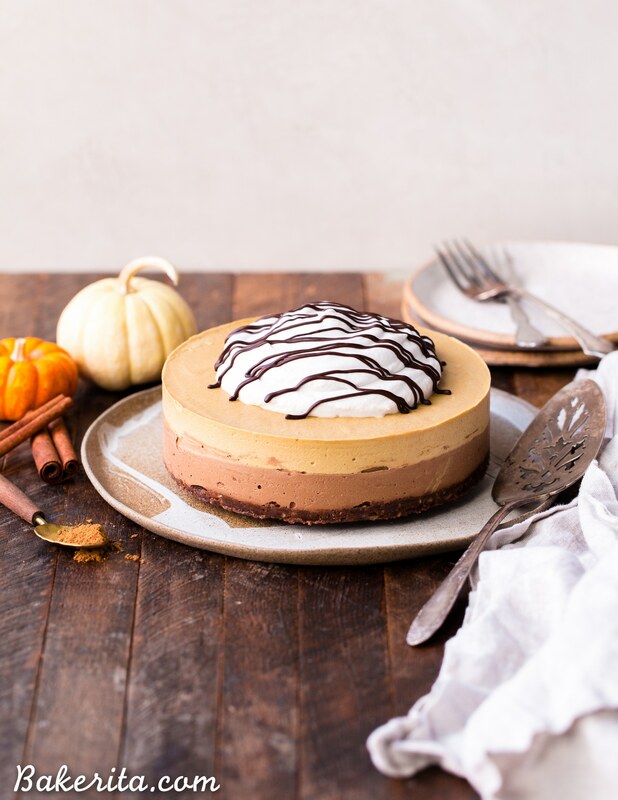 This recipe was amazing for Thanksgiving dessert! Made it long enough in advance that I didn’t need to freeze it. It firmed up nicely in the fridge with about 6hours before dinner and it kept really well for the few days after as we continued to enjoy it. Thank you! I made this at Thanksgiving and it was FAB! If I wanted to make this as bars instead of a cake would I need to double the amounts? Hi Lisa, no that’s fine – just use an 8×8″ square pan and the amounts will be perfect :) enjoy!